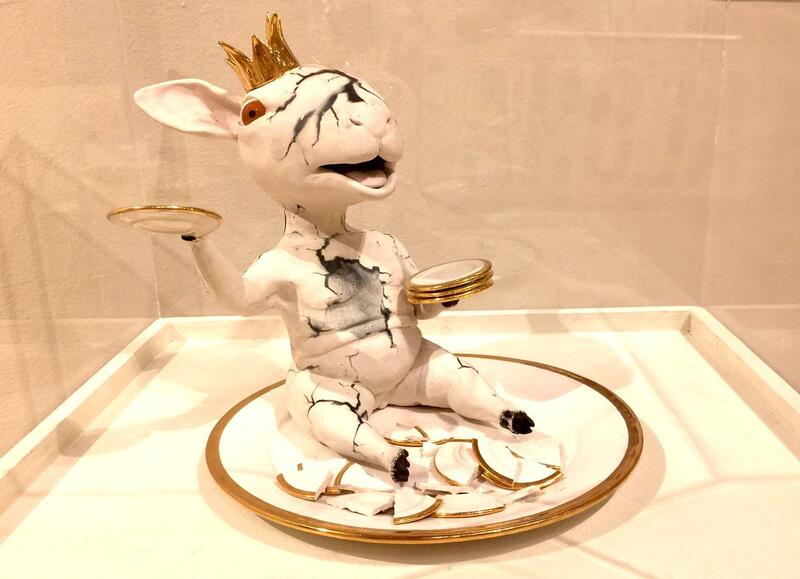 Amber Aguirre, "Queen Baby's Tantrum," hand built porcelain, naked raku. 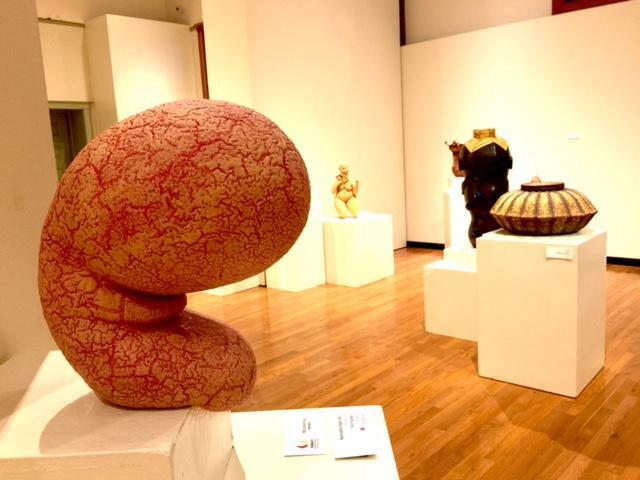 Hawai'i's first ever state wide juried show of ceramics shows strong figurative work. Over $1800 in prizes were given out, the State Foundation on Culture and Arts made purchases, and a capsule history of ceramics, island by island, was compiled for the occasion. "Ceramics of Hawai'i" continues through January 8, 2017 at the Honolulu Museum of Art School. A chat with the juror for Ceramics of Hawai'i 2017, David Kuraoka. 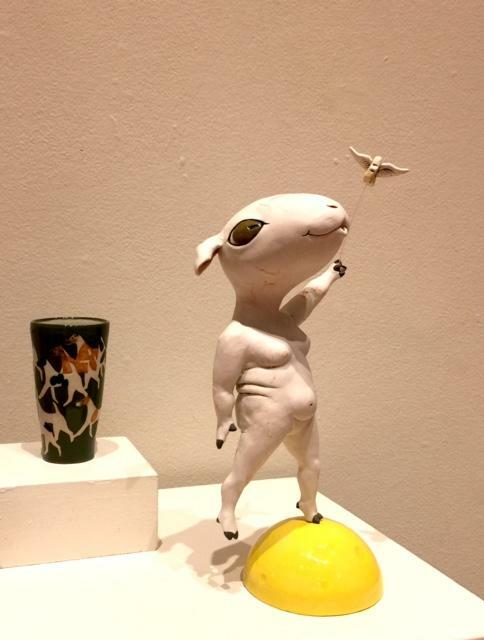 (l) Erin Yuasa, "Apocryphal Nadir #4," handbuilt clay. This piece was honored with a Recognition Award by the State Foundation. In the background, (c) Esther Shimazu, "Ningyo Fan," won the Best in Show Award. (r) Shigeru Miyamoto, "Interstrata," high fired stoneware, won an Award of Excellence. (far r) Christopher Edwards, "#85," hand built clay. 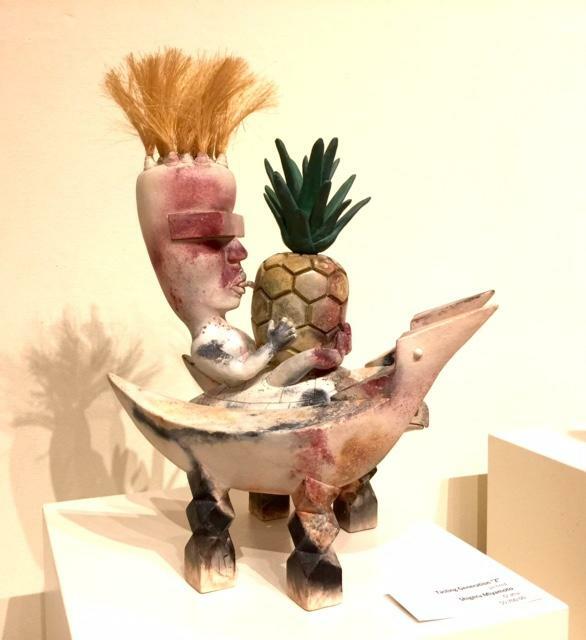 Ceramics of Hawai‘i, the first statewide juried exhibition of ceramic art in Hawai‘i, welcomed over four hundred entries from every island except Lana'i. 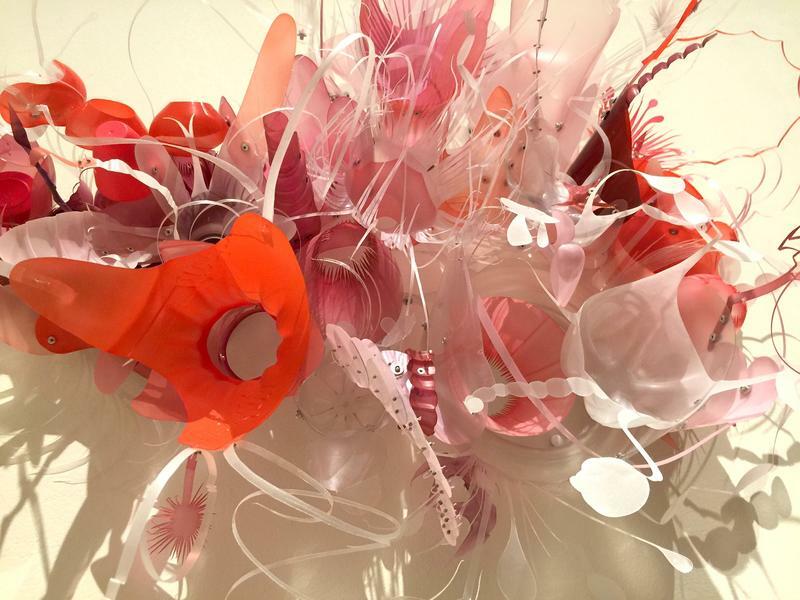 About a hundred pieces are in the exhibition, which continues at the Honolulu Museum School through January 8th. Organizers were able to award $1,850 in prizes, and three pieces were purchased by the Hawaii State Foundation for the Culture and Arts. Kuraoka says the awards prizes surpassed the national norm, and organizers hope to build upon them in the future. The Hawai‘i Potters’ Guild at Church of the Crossroads is celebrating its 50th anniversary in 2017. Find out about classes and more about the Ceramics of Hawaii show at their website. 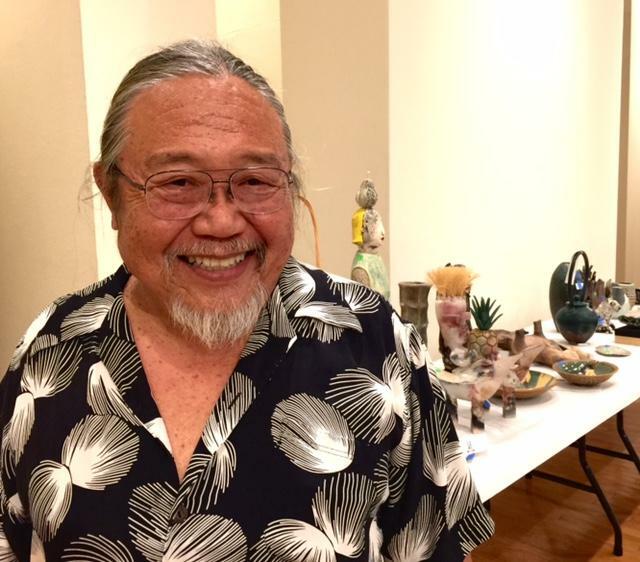 Artist, educator, David Kuraoka was the juror for "Ceramics of Hawai'i." Born on Kaua'i, he bases an international practice there now, working mostly with large scale pieces in clay and bronze. Leitner says the purpose of this statewide first is to link ceramics communities and showcase the work that has been developing here for decades, Hāwī to Hanalei. The juror for the show is a Kaua‘i based ceramist, David Kuraoka, internationally recognized and recently retired head of ceramics at San Francisco State. 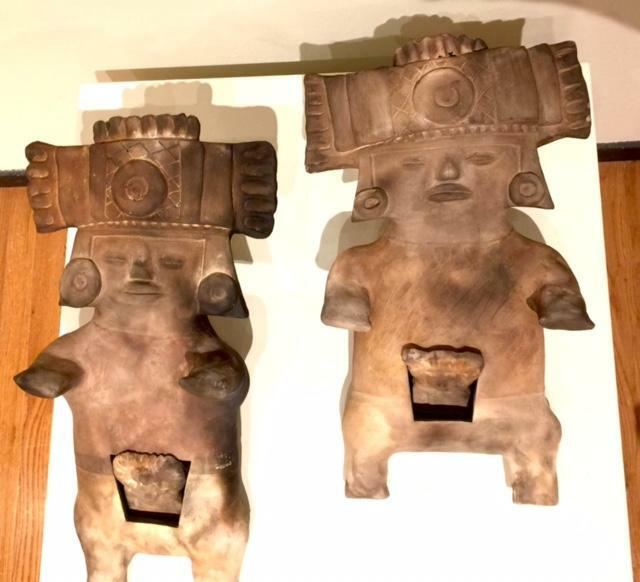 Roberta Griffith, "Pre-Columbian oddyssey--Virgins of Xochitecatl." Griffith works on Kaua'i, and with over 400 works submitted for this show, about a quarter of them were from Maui, Hawai'i island, Moloka'i and Kaua'i. Individuals and strong pottery enclaves have kept high quality work alive. Shipping for jurying is a forbidding task, and those who did should be applauded. Shigeru Miyamoto, "Tasting Generation "Z", pit fired. Pit firing after all that detail seems pretty risky, which makes the result that much more pleasing. Much of ceramic history is represented in this show, with echoes of pre-Columbian pottery all the way through Asian ceramics to contemporary low fire techniques with brilliant metallic over glazes. (top) Kenny Kicklighter, "Tree Hugger," stains, oxides. (l) Daven Hee, "black shino huggable pot," wheel thrown, shino glaze, stoneware. 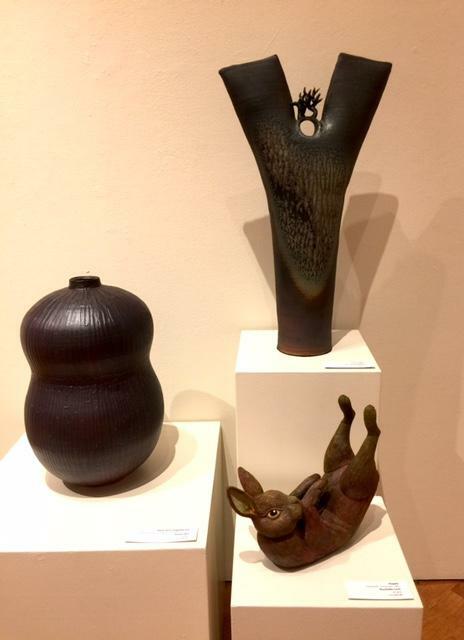 (lower r) Rochelle Lum, "Happy," hand built stoneware, raku. 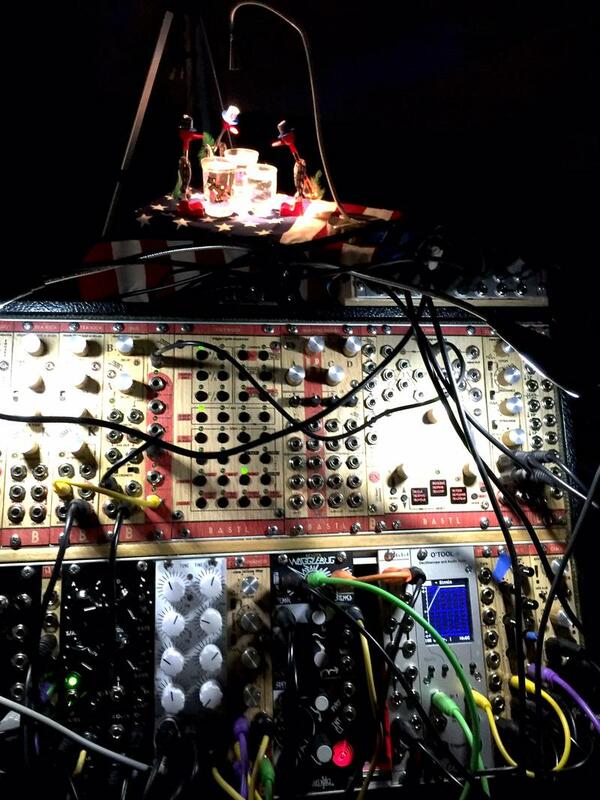 Kuraoka says, do Café---the online artists’ listing. He wants Hawai‘i potters to submit works to national shows now. (l) Jan Werner and Jon Rawlings, "All My Children--45 Years of Smooth Fox Terriers," etched clay. 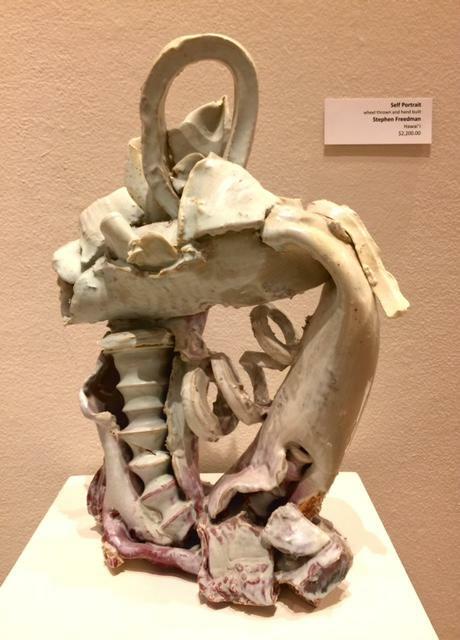 (r) Amber Aguirre, "Catch the Chop," hand built porcelain, naked raku. Many of these works are available for sale. A local bastion of ceramic creativity, the Hawai'i Potters' Guild based at Church of the Crossroads, is celebrating its fiftieth anniversary in 2017, part of the impetus for this show. Diana Tusher and others lovingly compiled notes to reconstruct the history of local ceramics. 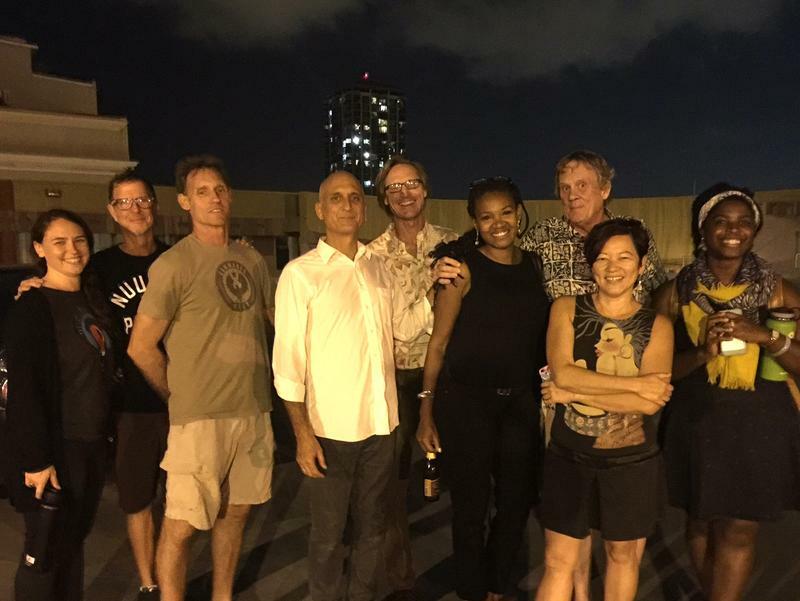 There are works are by seminal artists, Claude Horan, and Harue McVay, both influential professors at UH Manoa, as well as Toshiko Takaezu,. celebrated Honolulu potter who influenced generations at Yale. On the wall, a piece by Isami Enomoto of Ceramics Hawai'i, the fabled supply shop in 'Iwilei. Stephen Freedman, "Self-Portrait," Wheel thrown and hand built. 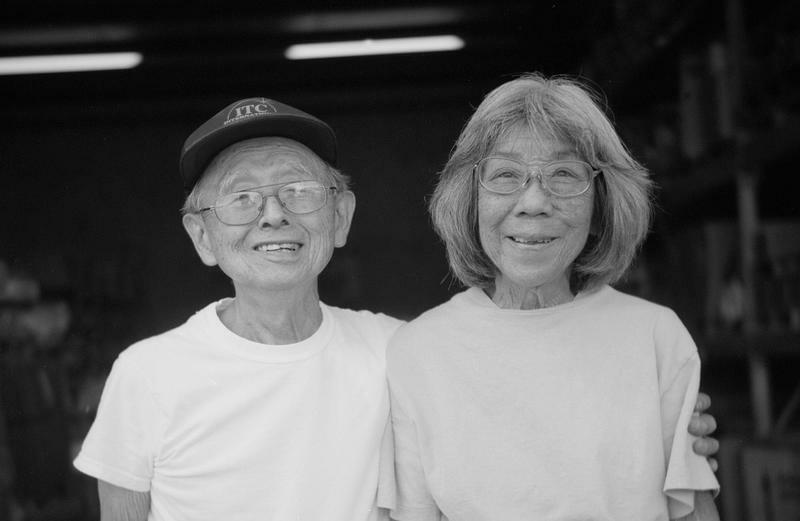 The recent passing of Isami Enomoto marks the end of an era for ceramics in Hawai‘i. He came of age during clay’s local heyday in the 1960’s and was a bed rock for ceramic artists up until a month before his death. HPR’s Noe Tanigawa reports on a quiet man who helped create a community. “Never doubt that a small group of thoughtful, committed citizens can change the world..."
“Never doubt that a small group of thoughtful, committed citizens can change the world; indeed, it's the only thing that ever has.” When Margaret Mead said that, she could have been talking about a lot of community groups, including the small, hard working team that has kept the ARTS at Marks Garage alive for fifteen years now. HPR's Noe Tanigawa reports.